Psypoke - View topic - WHO IS ASH'S DAD? Re: WHO IS ASH'S DAD? It's Not Oak or Giovanni, I know that. It's probably just a random Pokemon trainer. 99.9% chance that he doesn't have one because Nintendo forgot about it completely. I don't think that they would mention his dad being killed on a fathers day special. We haven't learned of him in around a decade outside of Delia's comments in the second episode, and may never, ever learn about him. Simply put, the characters that do not contribute to the series probably will be left unseen. The same goes for other character's parents as well - even though they're not the main character, they're still part of the main cast (or once were). We never learned of Misty's parents, and Tracey's family remains in similar status (though he was/is a more minor filler character, to my recollection). We don't know Dawn's father, either. Ash doesn't seem to even miffed by his father's absence in the very slightest, nor has he ever mentioned him or even alluded to him. He seems to be happily oblivious to that. I feel introducing him at this point... well, I feel it'd be too abrupt. It would have to be done smoothly and in a way that doesn't take away from whatever current plot point (as I feel intercutting stories like that dramatically reduces tension). I heavily doubt it's Giovanni. Nor do I think Professor Oak had a hand like that in Delia's family. I can't see how it could be a Pokemon in earnest. And just because Ash has an aura like Sir Aaron's doesn't mean Sir Aaron is Ash's ancestor. I'm not adverse to Ash's father being unveiled at all, though - I'm far more intrigued by that than adverse. I just don't see it happening. Mr. Mime is Ash's dad. You see how he's always sweeping up for Ash's mom? F/C: 4167-6843-2195; Name Tetra. Fight me! about ho-oh.... mmmm maybe that's like his father's pokemon or something like idk not like caught but a special relationship i guess like lugia, mewtwo, latios and latias, darkrai and stuff how they have a special connection with them 'cause i read how it always comes up theres something special about ho-oh and ash. about oak and giovanni... oak is deffenitly out. i think in like the first episode it would have showed soemthign special... instead it just says how his dad went off on a journey too. i guess it could be giovanni and like neither of them know it. and his dad like got fustrated about becoming a pokemon master and decided to take people's pokemon. but he's more for the money and it doesnt seem right for him to be ash's dad. mostly since it's more of a children's show. so in the end i think he's just somewhere out there in the world far away and the producers probably don't even know who it is yet. now were are misty and her sister's parents. they showed brook's dad and how his mom is dead. and then it shows may and max's parents, their father the gym leader and their mom. idk about many of the other people. but why are misty's sisters incharge of them gym... mostly being so young. where are their parents? i dont even think the authors and storyboard people know where the HECK dad is! Personally, I think that Ash Ketchum is the result of a previously abusive household. His father was a drinker which explains why his mother always seems so eager to be a perfect mother for Ash and provide him with everything he needs. Drunk father obviously provided her with insane expectations because... he was a selfish drunk and didn't provide Ash with any proper parenting. Eventually, Professor Oak stumbled upon the terrible going-ons of Ash's household and suggested that Ashley Ketchum get a divorce for the betterment of her son. Ash is obsessed with becoming a pokemon master so that he can escape his household and the terrible memories... he won't have to deal with his mother who is a mess, behind the scenes. Now, I know it seems odd, but think about it. It's been established that the Kanto and Hoenn storylines (in the games, anyway) take place at the same time. I've always thought Steven was in his thirties or forties; just as is Delia Ketchum. 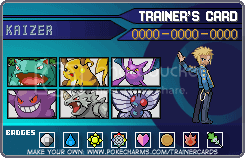 Steven is an incredibly powerful trainer, and so is Ash. Hoenn is far enough away from Kanto that Steven, who hardly seems like a family man, would not have to see his son too often. I believe they only met once in the anime; I could deal with that were I in his situation. It's been said that Ash's father is out on a pokemon journey; I think being champion of the Elite Four (albeit stepped down as of Emerald) is a pretty good thing for a man on a pokemon journey to become. I know arguments can be made against this, but arguments can be made against any theory; what it comes down to is that it's possible, just as is Giovanni. It's my belief that Steven is a likely candidate for Ash's father, so I'm sticking to it. why aint any people coming here anymore?? 1) Ash' dad is dead. 2) He is in a yet to be visited region. 3) Its Giovanni, or Steven Stone. Oak cant be his dad, Oak is Gary's dad, or Gandpa, whatever he is. It says so at the beginning of FR/LG. Trade wants: Good IV Scyther/Scizor and Good IV Pokemon from the Chansey family! I have lots of event Pokemon/TMs/Items for trade! PM me for a battle!I need Red Shards! I will trade Lugia/Ho-Oh/Other stuff for a Red Shard! In FR this rocket admin says to the trainer who is supposedly Ash," You look like Giovanni's kid." Maybe Ash is Giovanni's kid, but I don't think so. No idea how you guys think Steven is Ash's dad. Steven's dad is the president of Devon in Rustboro, who doesn't look that old. Also there's no resemblance between the two. As to Giovanni, I believe the scientist/admin said his son had red hair. So it could not be Ash. Some guess Silver, a character in the manga (Pokemon Special). Something ironic is the fact that after catching Ho-oh in the games there is the item Sacred Ash. i think i have the answer. There will be a season in the future like Heroes season 2 and 3 in which the parents of misty, ash and brock all knew each other before their children met. weve met brocks dad in season 1 already. maybe ashs dad asked him to check up on ash and later we will see brocks dad again when ash returns to pallet town to tell him about his father. as i was saying, all these parents set out on a journey together to save the world in a pokemon 2000 like story of the past and are journeying together very much like ash, brock and misty (though shes gone for now). and maybe ashs dad told oak before leaving to make his son grow up to be a pokemon trainer like himself and gave him pikachu which is actually the child of Ashs dads pikachu (if he has one). later the parents will meet the children in the last season of pokemon(if there will ever be one) to unite together to save the world once again. possibly ashs dad could be captured and they would have to save him! Sounds like romantic fantasy, but anything could be true right guys? Obviously, he's so special he doesn't need a dad lol. Maybe it's the same thing as with Anakin Skywalker in Star Wars (sorry I'm also a SW obsessor) or he was created by a parent pokemon like Arceus. Or is he such an advanced pokemon that he became human, or is he a Ditto lol? Or was he mutated at birth, really a pokemon? or is he from another TV show, is his real dad Homer Simpson lol but has his mom's last name? lol that would be funny, or if he was really the Yu-Gi-Oh guy's brother. I think maybe he has a case similar to my real-life conundrum! I dont know my dad either. Maybe his dad is his mom's old high-school flame??? That's who my dad turned out to be. Perhaps Sir Aaron is Ash's father. Ash's current mother, Deliah Ketchum, is Ash's parent. She might actually be a spinster. Maybe after Sir Aaron died, the Queen asks Mew to send Ash to the distant future to prevent similar mistakes. That's why Ash's aura is similar to Sir Aaron's. Come to think of it, Ash looks a lot like Sir Aaron. I had a theory for a few years. In the begining we know that ash's father went on a PKMN journey. Well he's probably still there, and when the series finally ends, in the episodes leading the the end ash is at some sort of champion vs champion battle, were he's fighting a man which he finds out the night before is his father, and then has some sort of internal conflict were he could beat his father in this match but if he beats his father he might still go wonder off untill he's the greatest then comes home, or lose to his father so they can go home together, but ash doesnt want to lose he wants to be the greatest.